Lady Harvatine: Happy New Year! Hope you're all having a great year so far! I'm just hanging out, getting bigger. I've got about 10 days to go until my due date and I'm feeling good. My mom's flying out next Thursday and we still have a couple classes to take next week so here's hoping I can hang on for a while. I'm a little worried about going early but I don't think it will happen. I was 17 days past when I was born and my brother was 21 days past! 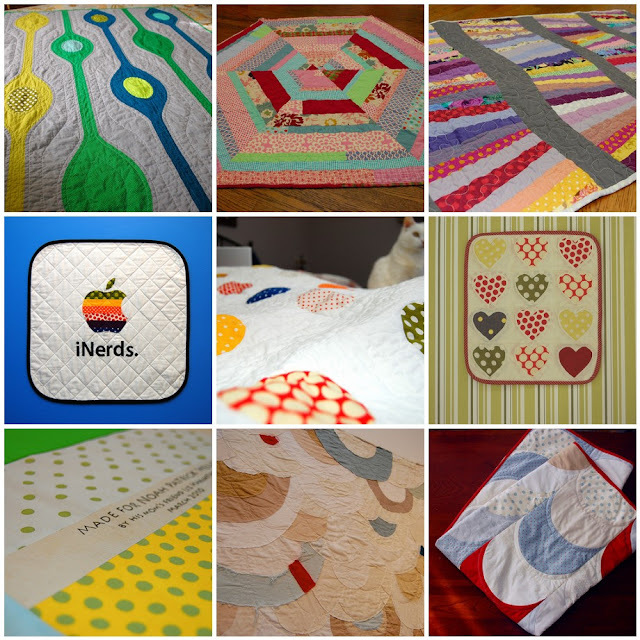 Have you seen the beautiful quilts this baby is collecting already? Here's one from Alissa and one from Latifah, both amazing and I can't wait to have a baby to lay on them! Right now I'm working on a queen sized quilt made from bee blocks that will go on the big bed in the baby's room. I'd love to get that done before she's born so keep your fingers crossed for me!